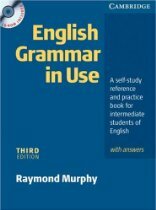 "English Grammar in use-2nd edition by Raymond Murphy". In this book I have a doubt about something. I checked the answers but, they aren't similar to my answers. So I need to know if my answers are correct or not. 1) Mike is looking for his key. He can't find it. My Answer: He has lost his key. 2) Margaret can't walk and her leg is in plaster. My Answer: She has plastered in her leg. Book Answer: She has broken her leg. Diana: The book is correct. Take a look at your word options from above...arrive, break, go up, grow, improve, lose. From those options the only one that makes sense is break. If you wanted to focus on the plaster (in real life, not in this exercise) you could say she is wearing a cast (that's what we call plaster) on her leg. ON not IN...in her leg means inside...like her bone is in her leg and the cast is on it. 3) Maria's English wasn't very good. Now it is much better. My Answer: She has improved her English knowledge. Book Answer: Her English has improved. 4) Tim didn't have a beard last month. Now he has a beard. My Answer: He has grew beard. Book Answer: He has grown a beard. He GREW a beard or He HAS GROWN a beard. 5) This morning I was expecting a letter. Now I have it. My Answer:I have got/received the letter. Book Answer: The letter has arrived. Diana: Again you are focusing on YOU and the book is focusing on the letter. You are not wrong when you say "I have got the letter". I would contract the sentence, "I´ve got the letter". 6) Last week the bus fare was 80 pence. Now it is 90. My Answer: Bus fare is increased. Book Answer: The bus fare has gone up. arrive, break, go up, grow, improve, lose. Here the only one that relates to increase is GO UP. I got full am totally confused. Are my answers correct or not? (at least close?). Please check and correct my answers. I went through your answers and you are very close with most of them. Just watch out for the simple past verses past perfect. Also, when the book focused on the objects involved in the example you tended to focus on yourself. (I got the letter...verses the letter arrived). This is not wrong but in English we do tend to focus on the objects sometimes. So when you do further exercises try to focus on both. Do one sentence focusing on yourself and then switch the perspective to focus on the object. I'm glad that you took the time to send me your questions. It is very frustrating when you are studying at home with a book and you are not sure if your answer is totally incorrect or just a different option from the book. So if you or ANYONE has trouble in the future with their self studying please send me your questions and I will be happy to clarify your doubts for you. Also, I just wanted to mention that the "English Grammar in Use" books are a great choice! They explain the grammar and then have exercises to go with the explanations. I think they are a great resource for studying by yourself. ------- stitch in time saves nine. ------- Wisdom is a great quality. ------- laughter is a ------ best medicine. A stitch in time saves nine. It is a reference to sewing but that doesn't really matter. What matters is what it means. We say "a stitch in time saves nine" when we want to tell someone to do something well the first time. So if you are writing an email write it properly and check it before you send it because if you don't answer all the questions or provide all the information you need to then you will end up doing more work in the future (sending more emails). wisdom is a great quality. I have never heard this one before but I think it is literal. Meaning that when you have wisdom or intelligence that comes from experience and time you are very lucky. Thank-you very much Diana! I am working hard in my studies, because in 6 months I need to take my TOEFL exam. Diana, is it possible to take the TOEFL exam within 6 months from my studies?. I will take the TOEFL class later on, but before I need to know the basic things,then I can learn more advanced things. I hope I can reach my goal, and I am very happy about your great website. Now I feel like I have an instructor behind my back and watching my studies..! Before I got a little scared about my study way, But now it's reduced..!